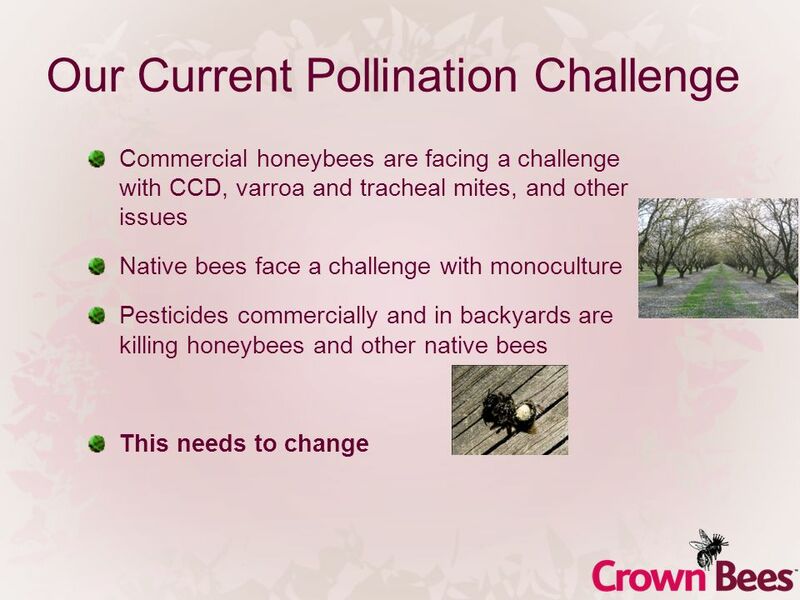 Our need for Healthy Pollination Club, school, etc.(change)date. 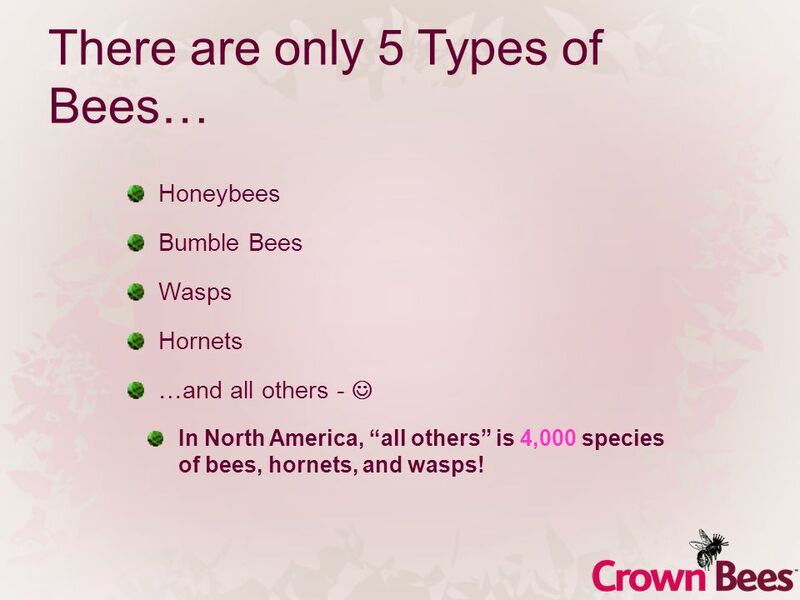 6 There are only 5 Types of Bees… Honeybees Bumble Bees Wasps Hornets …and all others - In North America, all others is 4,000 species of bees, hornets, and wasps! 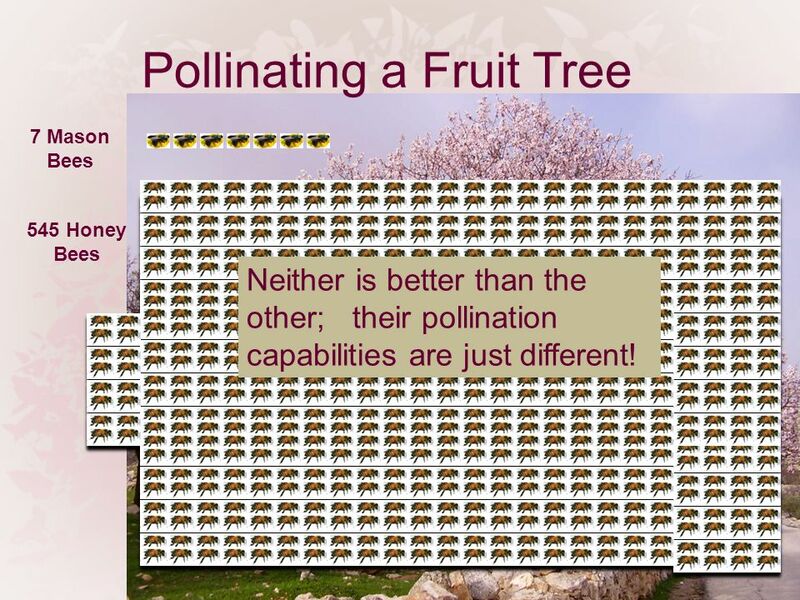 12 Pollinating a Fruit Tree 7 Mason Bees 545 Honey Bees Neither is better than the other; their pollination capabilities are just different! 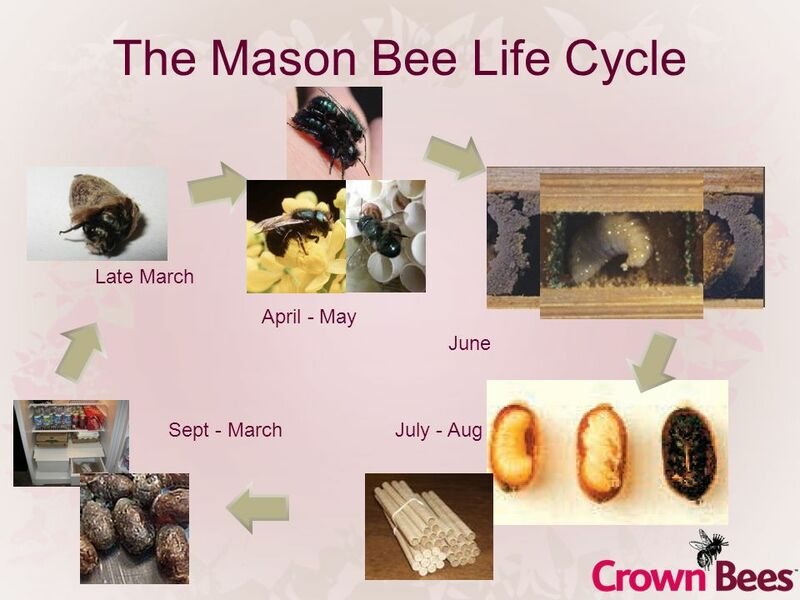 21 Harvesting in the Fall Wait until you have mason bees and look at www.crownbees.coms pages on how to harvest. 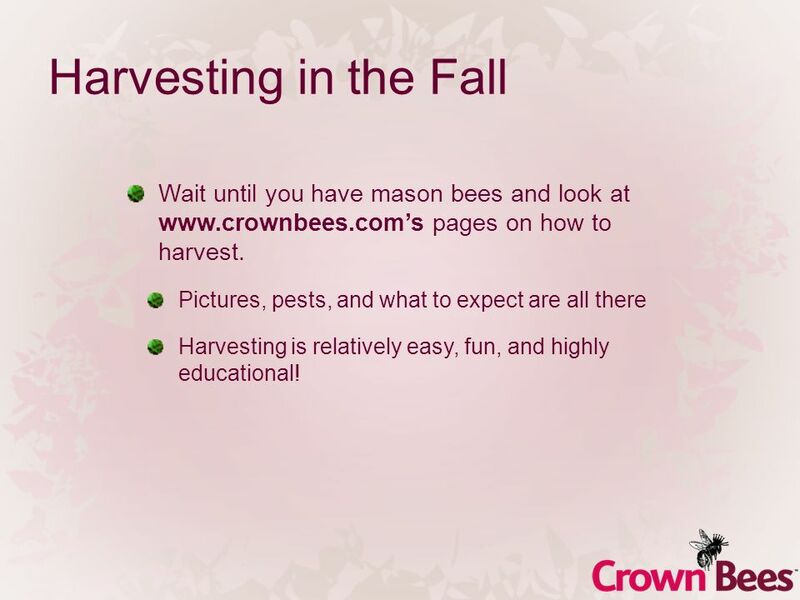 Pictures, pests, and what to expect are all there Harvesting is relatively easy, fun, and highly educational! 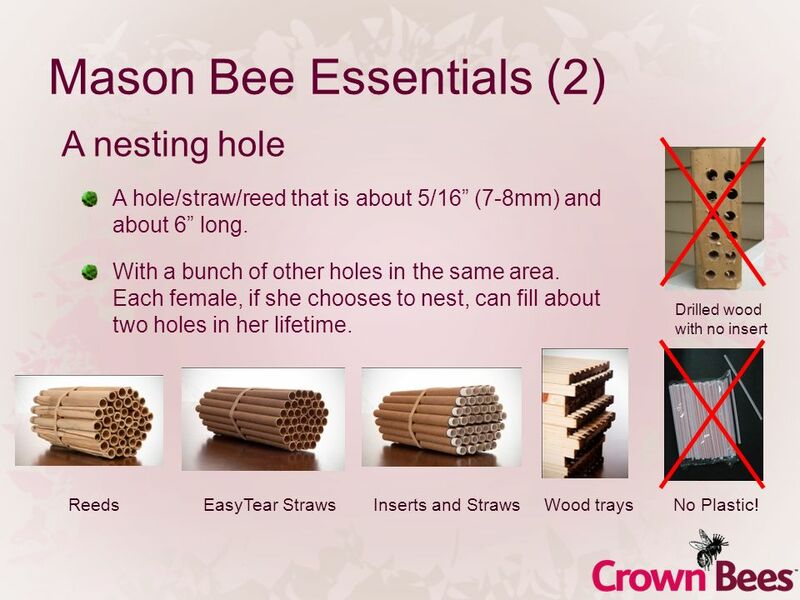 22 Five Easy Steps for Healthy Mason Bees 1.Put out your mason bee cocoons/straws when its warm (Late March ~ 55°F) 2.Put straws/reeds away in early June (away from pests!) 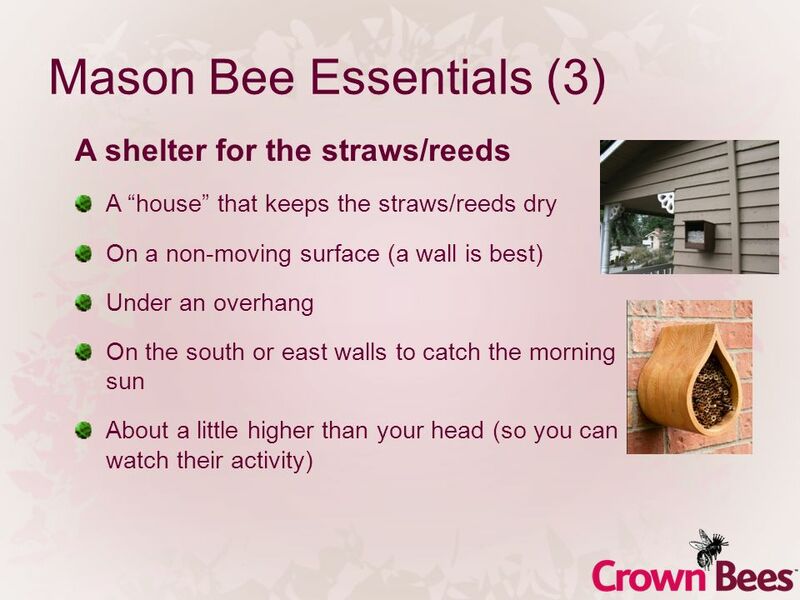 3.Harvest some straws/reeds in October (Most important!) 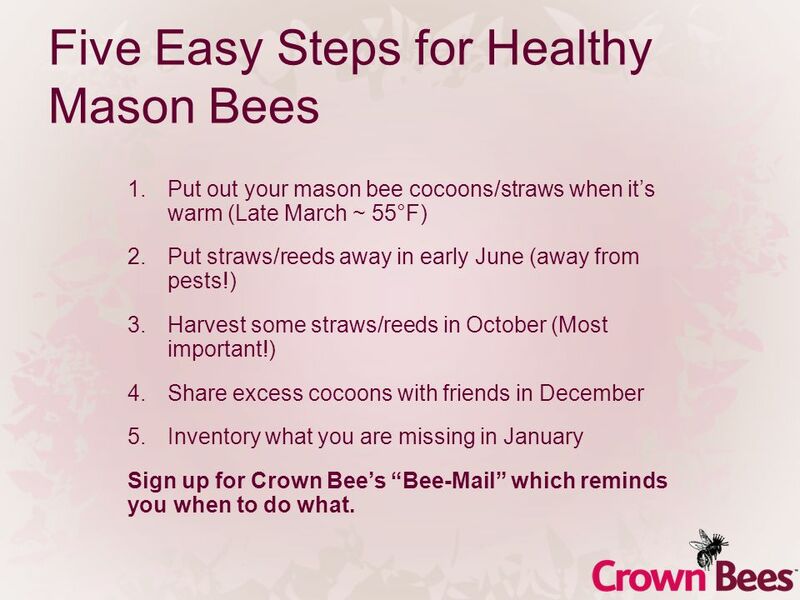 4.Share excess cocoons with friends in December 5.Inventory what you are missing in January Sign up for Crown Bees Bee-Mail which reminds you when to do what. 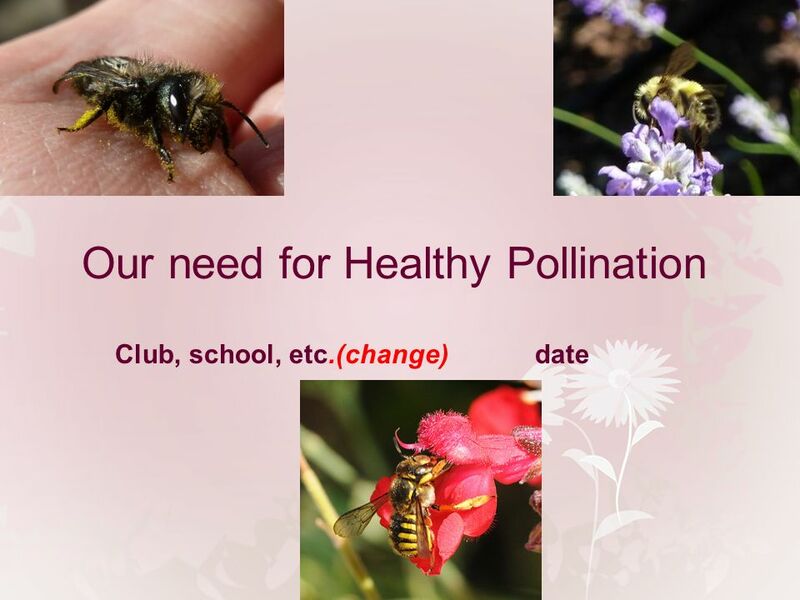 Download ppt "Our need for Healthy Pollination Club, school, etc.(change)date." California Native Plants: The Most California Friendly Plants on Earth. 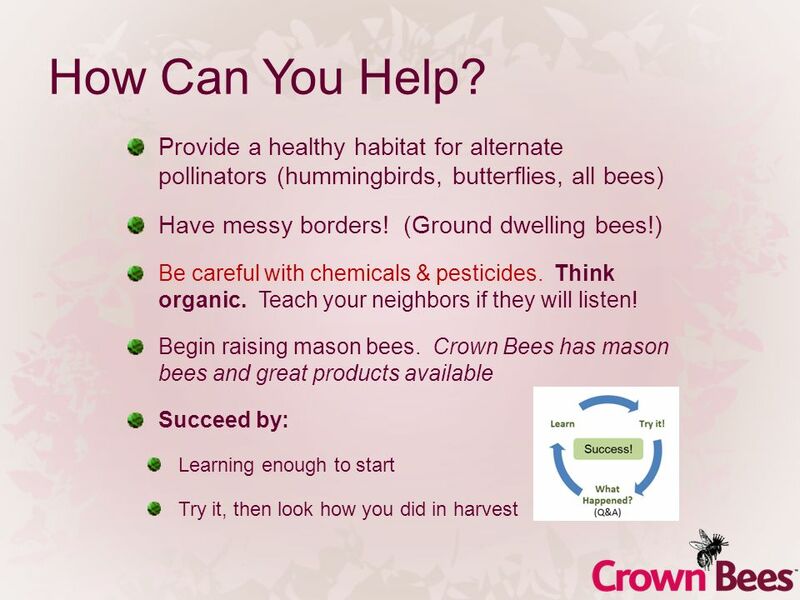 The Birds and The Bees and Vegetables Jim Shrefler Extension Horticulturist Oklahoma Cooperative Extension. 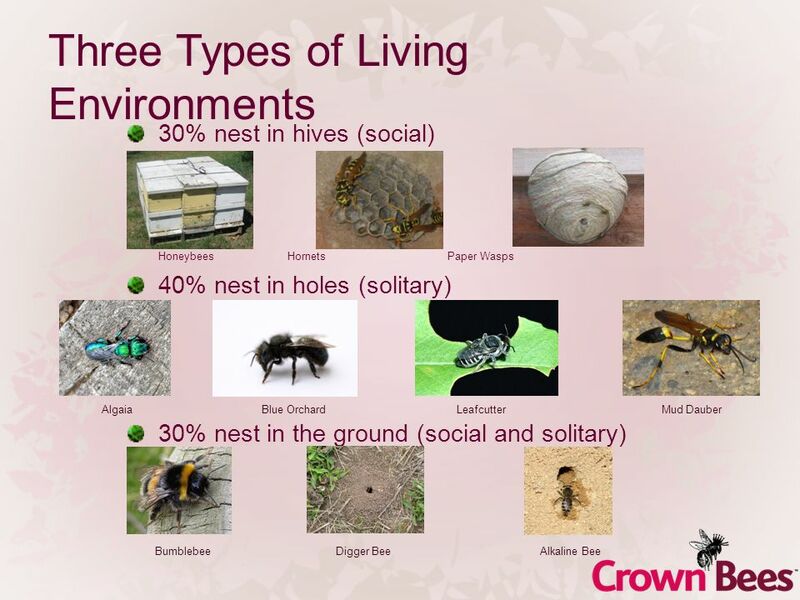 Insect Fact File Ants Bumble Bees Dragonflies Ladybugs Moths Termites. 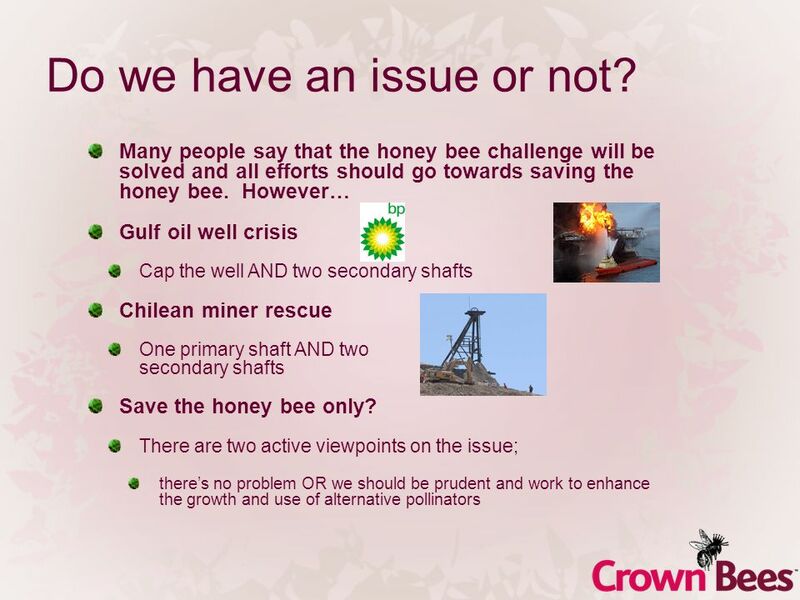 And 1/3 of crops to feed our meat sources  Sole Reliance for Crops, Orchards  Decline Debate Mono-Pollination (honey bee) puts food supply at risk. 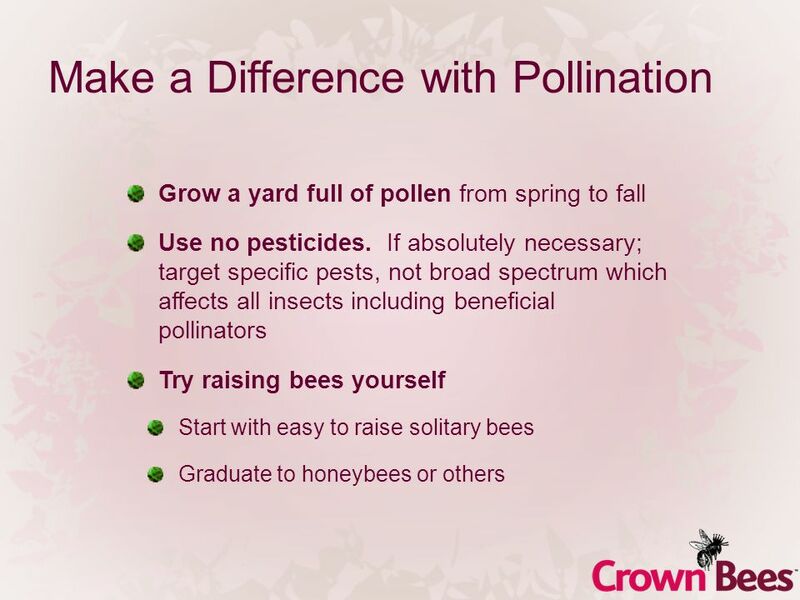 Bee Friendly Flowers By Keaton & Lucas The Garden Group. 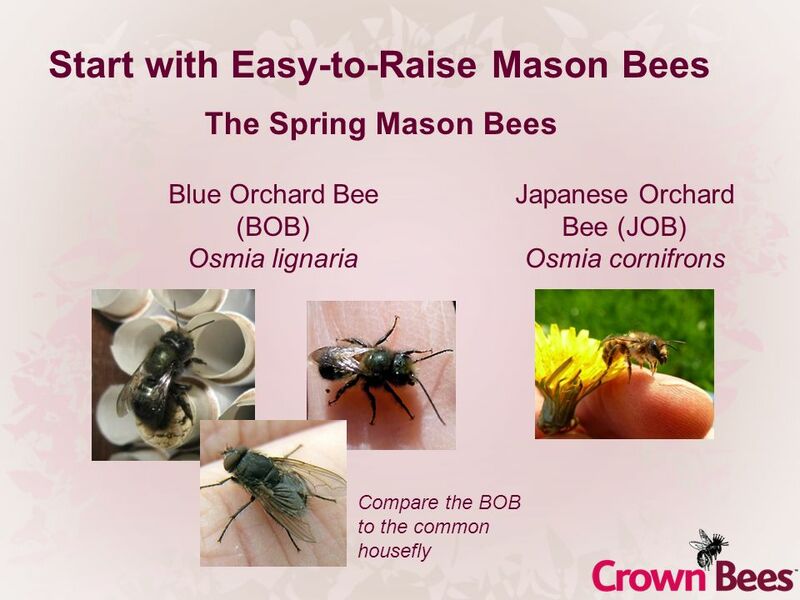 Common Bees in Michigan Julianna Tuell, Rufus Isaacs Anna Fiedler, Doug Landis Department of Entomology, Michigan State University. 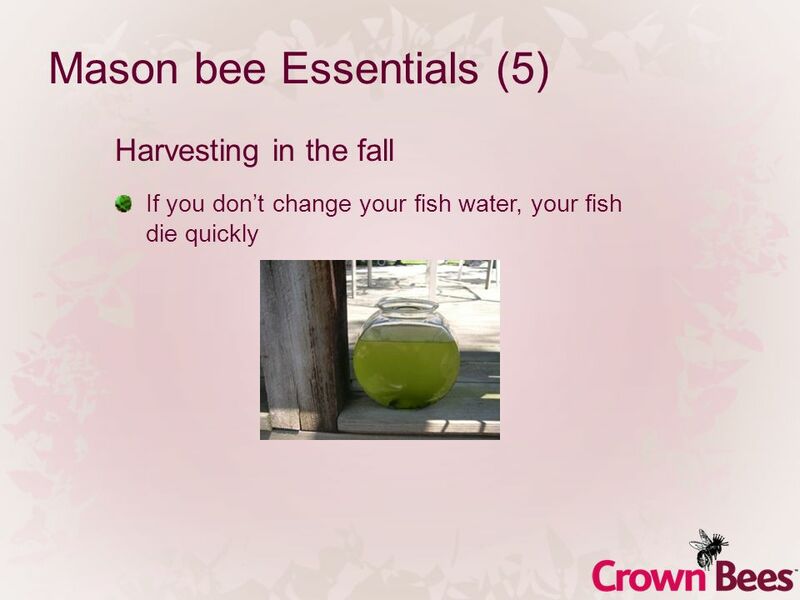 Backyard Breeding of Northern Queens December 2, 2014. 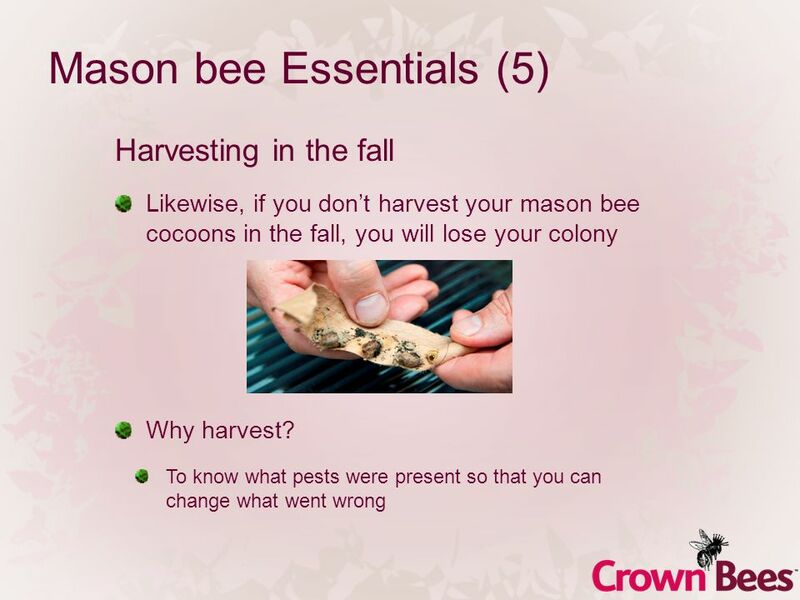 Bees research KFC Style. 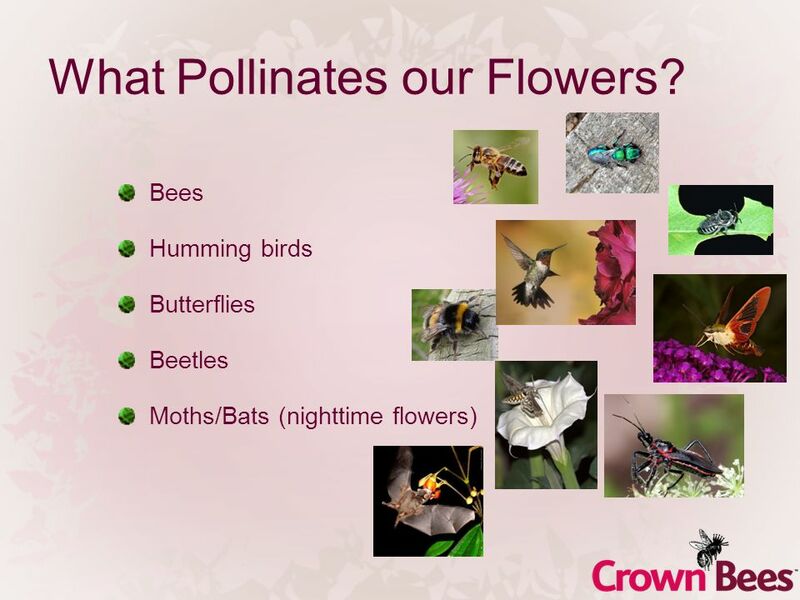 Why are bees so interesting? 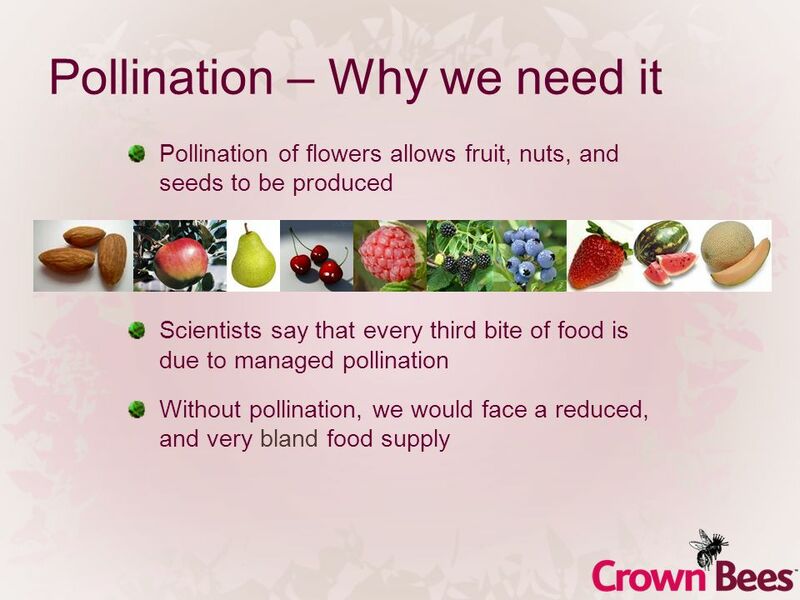 Bees carry around a special source of sticky thin liquid called nectar. 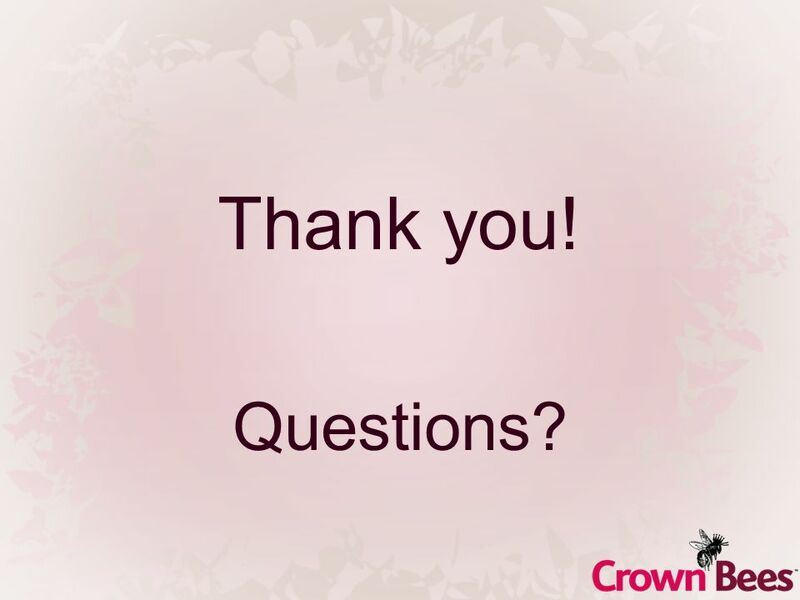 It takes approximately 22,700. 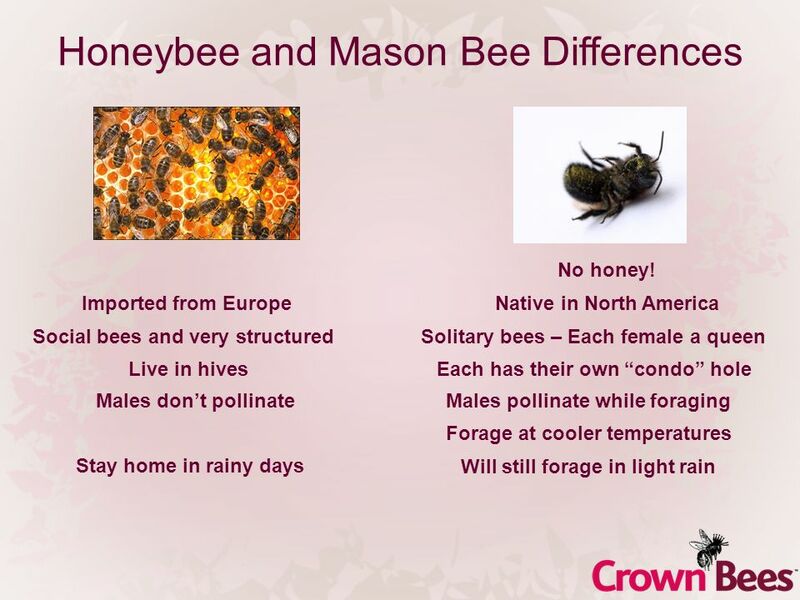 Just a reminder- these bees DON’T produce honey. 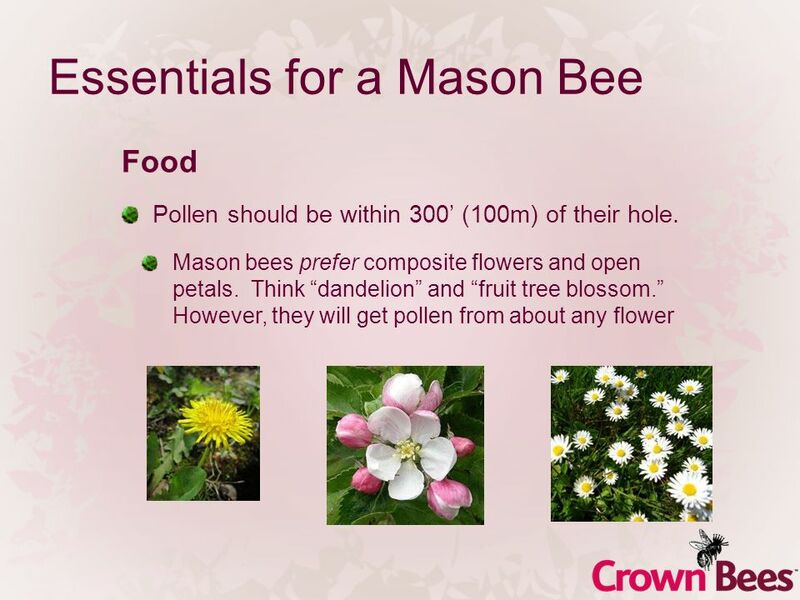 Orchard Mason Bees – are common throughout North America. 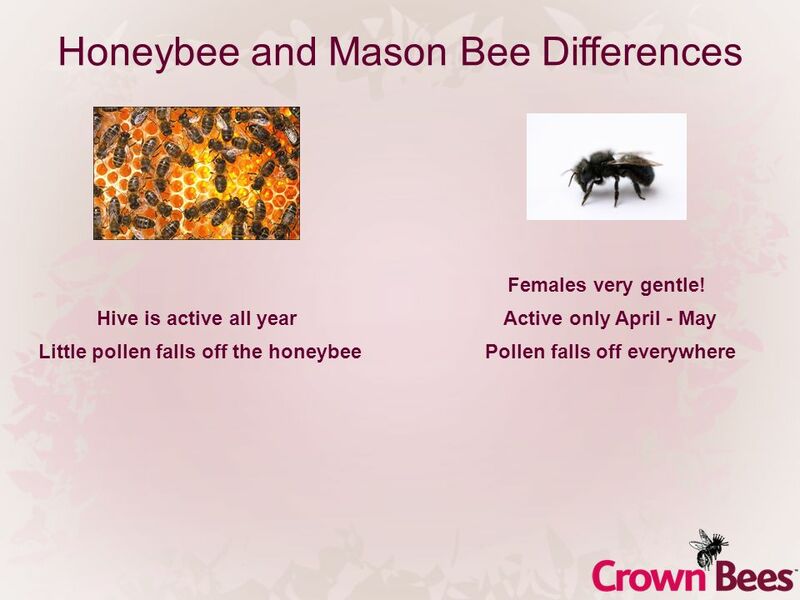 They are called by different names such as. 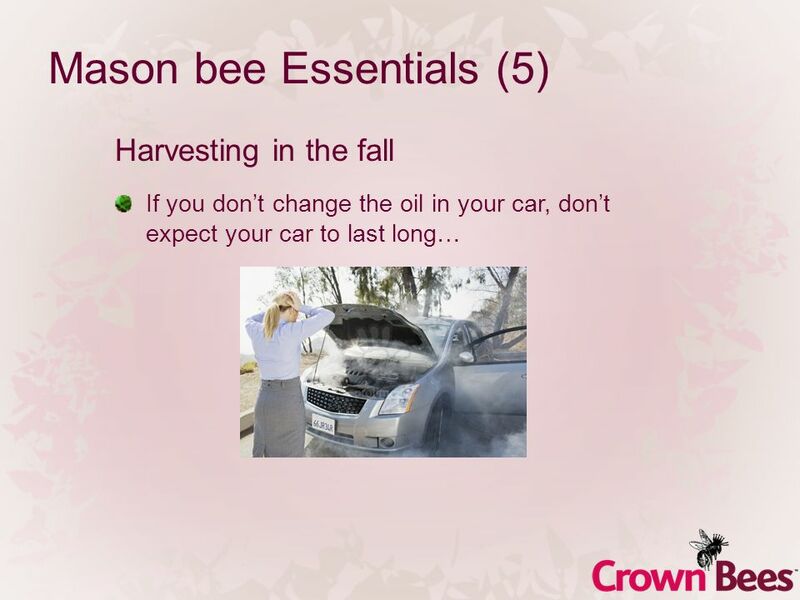 Establishing a Pollinator Habitat Garden at Notre Dame Preparatory School and Marist Academy Fall 2010 Prepared by Ms. Nemon. 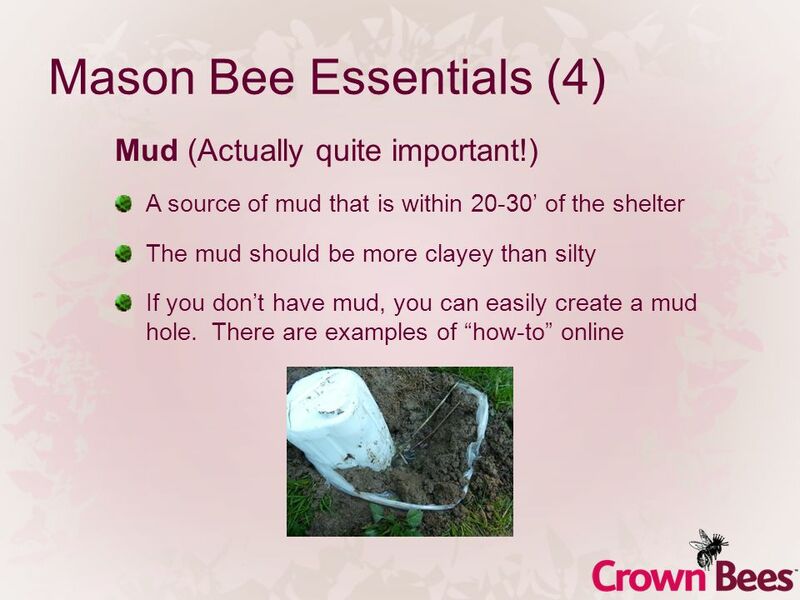 Essentials of a Garden By: Kristen MacAulay EDU 345 March 22, 2004.